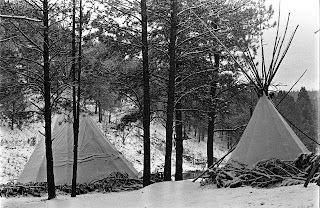 In 1980 – Frank Black Elk was the director of the American Indian Movement in Colorado and, as such, called a press conference to announce that AIM was establishing an encampment in the Black Hills just outside Rapid City, South Dakota. Yellow Thunder Camp was named after Raymond Yellow Thunder who had been beaten to death by two white men in a small Nebraska town bordering the Pine Ridge Reservation. At the time of this press conference there was a new media organization working in the Denver area – Multi-Cultural Communications. This was a group of individuals from various colleges and universities in the Denver/Boulder area. 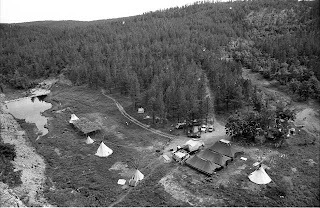 Known as MCC – several individuals from that organization undertook a video project to tell the story of what AIM was doing at Yellow Thunder Camp. At the end of 1980 a film crew of four individuals took off to Yellow Thunder Camp and shot several hours of video on the Pine Ridge reservation and at Yellow Thunder Camp in the Black Hills. The end result of that project was a film called Return to Paha Sapa. 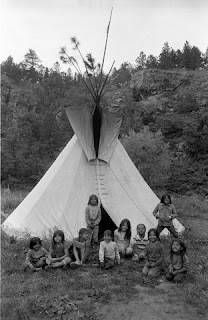 During this trip – I was able to photograph the camp and obtained some incredible images some of which were published in various community newspapers in Denver and one being published in New Age Magazine. Recently I was made aware of a film project and was asked if some of these images might be available for inclusion into the film Holy Man. I sent 40 images to the film makers and they picked 12 for possible inclusion into their project. Last word I got was they were working on a final draft for submission to Sundance film festival in Utah. No word yet as to whether or not they were able to finish post production in time to get it to Sundance. My dad was at Yellow Thunder camp in the 80's... maybe he was in some of the pictures? I would love to see them!!! Something awry in the sky.